Since its official works involvement began in 1979, Honda has left a lasting imprint on the history of the World 500cc Motocross Championships, and has taken the title from one season to the next. In fact, the works was directly involved in this premier category from 1979 to 1986, eight seasons of unbelievable work for the competition department, the omnipotent Honda Racing Corporation. It was the HRC that was responsible for the fantastic handbuilt prototypes. The racing CRM had not one component in common with the CR. Furthermore, each works rider was entitled to a machine custom-built to his personal requirements -–choice of engine characteristics, four- or five-speed transmission, frame geometry, suspension and so on. The logistics were impressive. During a race in Austria, one of the riders caught his leg on the radiator cap. That evening, the team manager reported the incident to Japan and three days later a new radiator shield arrived by courier at the team's Belgian HQ. In 1986, the American Motorcycle Federation formulated its "production rule," which restricted works teams to using machines based on production models. Prototypes that had cost more than $150,000 to build became museu-m pieces overnight, but Honda continued to accumulate honors with highlydeveloped stock machines and the leading category was phased out in 1991. It was the end of an era. 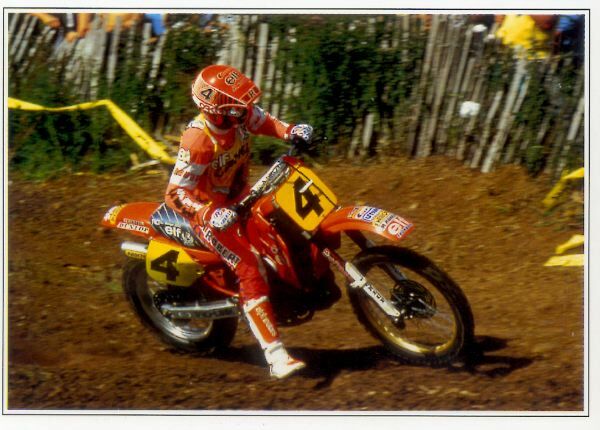 The works Honda 500 motocross bikes 'ruled the leading class in motocross; the photo shows Georges Jobe, private entrant in 1987.